Note: Only administrators and accounts with Temp ban access can manage banned accounts. For more information, see Adding Administrative Users. 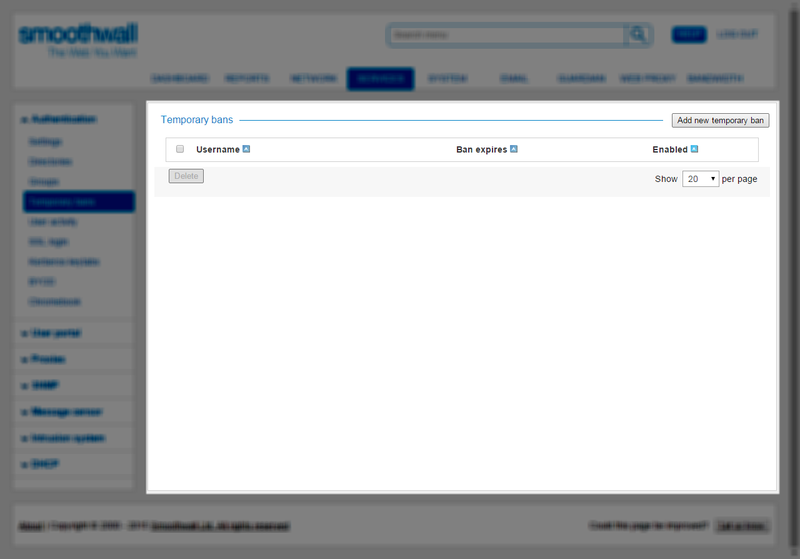 The Smoothwall enables you to temporarily ban specific user accounts. When temporarily banned, the user is added to the Banned users group. Note: You can apply any web filtering policy to the Banned users group. 1. Go to the Services > Authentication > Temporary bans page. 2. Click Add new temporary ban. • Status — New temporary bans are enabled by default. Clear the check box to create a disabled ban. • Username — Enter the user name of the account you want to ban. • Ban expires — Click and select when the ban expires. • Comment — Enter an optional description of the ban. 4. Click Add. The Smoothwall enforces the ban immediately. Note: If the Guardian module is installed, the user sees the block page when they attempt authentication during the temporary ban — see Managing Block Pages . Tip: There is also a ban option on the Services > Authentication > User activity page — Viewing User Activity . 2. In the Current rules area, select the ban and click Remove. The Smoothwall removes the ban. 2. In the Current rules area, click Remove all expired. The Smoothwall removes all bans which have expired.